Discover how it was in 'the good old days' and get with the local culture at the third installment of the Canarian Folk Fest in Arona. Featuring crafts, food market and dance performances from folkloric bands. It's also a great opportunity to pick up some unique souvenirs and gifts to take back home! The event will be taking place every Thursday until the 22nd of March 2018 at the Plaza de La Pescadora in Los Cristianos with the crafts and gastronomy market starting at 4pm. The contemporary musical performances and dancing start at 8pm and last until 10pm. 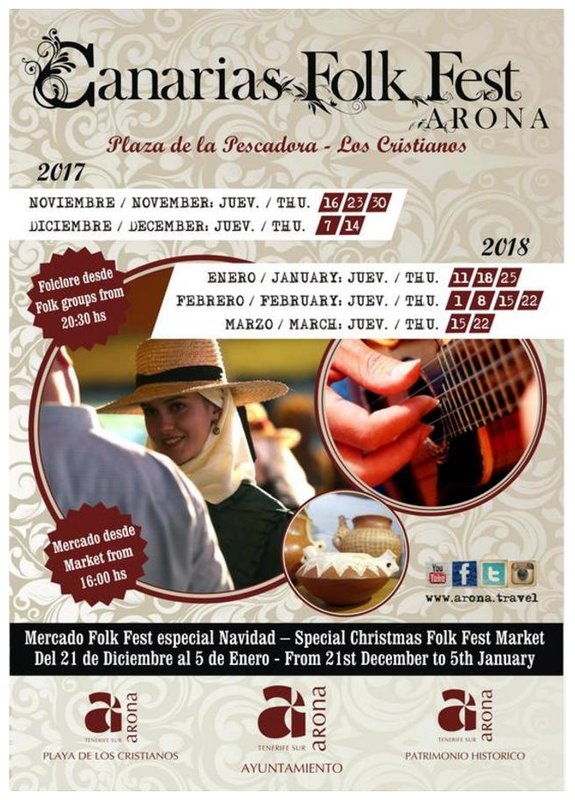 This event is organised by Arona townhall - Participación muestra de alimentación y artesanía tradicional y contemporánea Canarias Folk Fest Arona 2017/2018.